But the company planning to build a pipeline takes issue with claims about its labor agreement. AUGUSTA — Gov. Paul Le-Page on Thursday criticized a natural gas company that plans to invest $350 million to bring a natural gas pipeline through central Maine, saying a labor agreement the company adopted will favor unions and discriminate against most Maine construction workers. LePage said Summit Natural Gas of Maine would require Maine contractors and subcontractors to sign union agreements to bid and work on the 88-mile, steel natural gas pipeline it plans to install this year from Augusta to Madison. Since most Maine construction workers aren’t affiliated with a union, LePage said the project labor agreement, known as a PLA, would prevent them from getting the work and instead force the company to bring in out-of-state workers. Summit is one of two companies competing to bring natural gas pipelines to homes and businesses in the area, and it plans to start pipeline construction in the coming months. 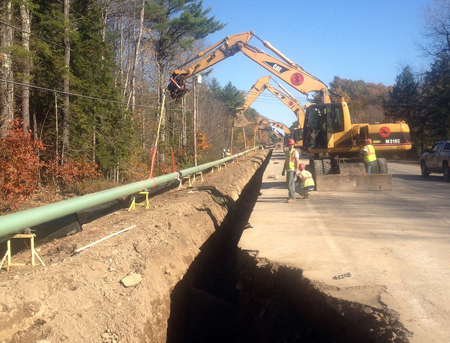 The other firm, Maine Natural Gas, already has started laying pipe in the Augusta area. LePage’s remarks — which apparently were coordinated with groups that ran a newspaper advertisement Thursday also critical of Summit — represent the first time the governor has involved himself in discussions about natural gas projects in central Maine. The full-page advertisement, published only in the Kennebec Journal, was paid for by the Associated Builders and Contractors of Maine and Associated General Contractors of Maine. 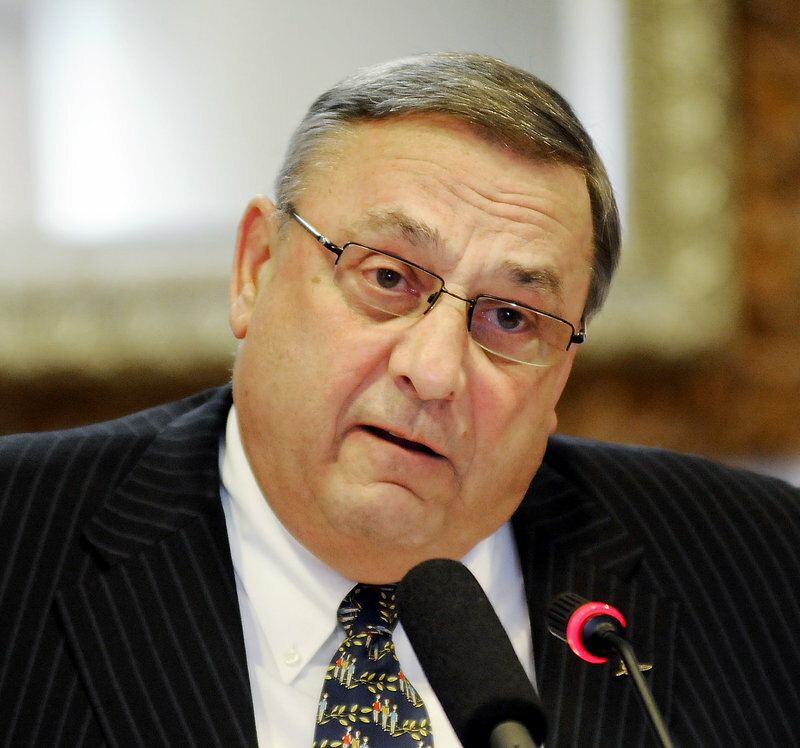 State union leaders said Thursday they were dismayed by LePage’s remarks. “It’s really disappointing a governor who claims Maine is open for business would play politics when a company is planning to invest over $100 million in Maine, create hundreds of good-paying jobs and lower energy costs,” said Matt Schlobohm, executive director of the Maine AFL-CIO. Officials with Summit Natural Gas of Maine said the governor’s statement mischaracterized the agreement and said it’s only for the steel portion of their pipeline project, which they said is the smaller of two pieces. Michael Duguay, director of business development for Summit, said the polyethylene pipeline that will come off the steel backbone of the system and distribute gas to homes and businesses is the largest part of the project. He also said there is no similar labor agreement in place for work on those lines. Duguay said the 88-mile steel pipeline accounts for about $100 million of the project, and will be installed mainly this year. The polyethylene line will cost some $250 million and its installation will take place over the next four or five years. Duguay said the agreement on the steel pipeline will require contractors to abide by the National Pipeline Agreement, which he said sets conditions for workplace safety and other standards firms must meet to qualify to work on the Summit project and others like it. He said non-union firms can still bid on the project, as long as they meet those standards. However, James Cote, director of government affairs and public policy for the Maine chapter of Associated Builders and Contractors, said Summit’s project labor agreement requires contractors who wish to bid on the project to become a signatory to a union agreement. That would require them to use union laborers first, by seniority, before using their own workers, Cote said. Dan Hucko, spokesman for Summit competitor Maine Natural Gas, said his company doesn’t use project labor agreements because it “wouldn’t want to exclude qualified people from getting a chance to bid.” That firm is owned by Iberdrola USA, which is also the parent company of Central Maine Power Co.